Journalist Jason Zengerle is the 2019 winner of the Newhouse School’s Toner Prize for Excellence in Political Reporting. The prize was awarded at a ceremony March 25 in Washington, D.C. NPR’s Lakshmi Singh ’94, an alumna of the Newhouse School, was master of ceremonies. Zengerle is a contributing writer for The New York Times Magazine and a correspondent for GQ. He won for stories in each publication that explored the trickle-down effects of the Trump presidency on the House Intelligence Committee, led by Rep. Devin Nunes (R-California), a strong Trump ally; the remaking of the federal courts; and the political promise and peril it has posed for certain Democrats. In addition, honorable mention recognition was given to Isaac Arnsdorf of ProPublica and Glenn Kessler, Salvador Rizzo and Meg Kelly of The Washington Post’s Fact Checker. Arnsdorf was recognized for a series of stories looking at the influence of some Trump donors and associates who, with little or no background in either the military or health care, are working to shift the care of the nation’s veterans to private providers, often at a higher cost to taxpayers and at the expense of veterans’ health. The Fact Checker team was recognized for a sampling of the over 5,600 false or misleading claims made by Trump. It includes a roundup of the team’s findings in 2018, an ongoing database of statements fact-checked and analysis of Trump’s statements at a campaign rally in Montana. This year’s Toner Prize competition drew more than 100 entries from across the country and from across media platforms. This is the ninth year the Newhouse School has awarded the $5,000 prize, which is named in honor of late alumna Robin Toner ’76, who was the first woman to serve as national political correspondent for The New York Times. 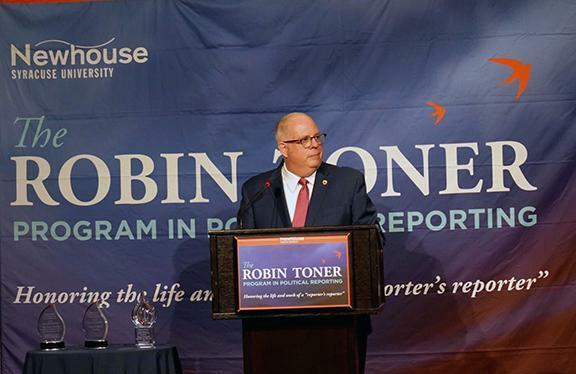 For more information about the Toner Prize and the Robin Toner Program in Political Reporting at the Newhouse School, visit tonerprogram.syr.edu.